No not Bill Clinton, Bill Bryson. I dashed into the library last week just to see who was sitting waiting to come out for a ride and there was Bill Bryson waving his hand in the air and looking pretty eager but drat it, The Life and Times of the Thunderbolt Kid only available in cassettes so I had to settle for his magnus opus The Short History of Nearly Everything. Wow, suddenly this seemed like a really good idea. Much as I love my guests, take a break from all this navel-gazing solipsism and sixteen CD's later I'd know everything I ever need to know about everything there has ever been.This version not read by Bill who probably doesn't have the time and I have no idea who William Roberts is, but give the man a medal because this unabridged version no mean reading feat.He is consistently expressive and interesting and kept my attention, especially given the often rather dry subject matter (for me). I made an immediate start and by the end of the first day I was well up on atoms, the Big Bang, and super novae discovered by a vicar in Australia. It was all a bit much to take in, space is big and Bill uses good analogies to explain scale and time.Vast quantities of superfluous factual information has harried its way into my grey matter as I've schlepped around the lanes.I'm beginning to feel mildly scientific in that Tomorrow's World crikey I never knew that sort of way, though I'm a little inexact on the fine detail. Do you know how long it takes for the light from a super nova to reach earth? Well it's slipped my mind but it's zillions of light years. Do you know how heavy the earth is? It's up in the trillions of tons. Day Two and for reasons best known to the NHS I had clocked up ninety-two visiting miles by the end of the day, that's a lot of listening. 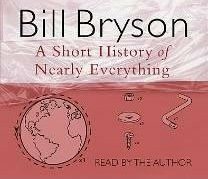 Bill and I have worked our way through planetary explanations then a quick trot through gravity and the life and unusual habits of Isaac Newton. I was lucky to keep the car on the road as Bill described how Newton stuck a bodkin through his eyeball as far as it would go and waggled it around "just to see what would happen". Then he stared at the sun for hours "just to see what would happen". Thankfully we've moved on through basic geology and we're onto fossils and the 19th century collector, Mary Anning.Now I'd like to do as Bill suggests and check out her collection at the Natural History Museum, apparently she made little money from her discoveries despite spending thirteen years painstakingly chipping out a whole fossilised dinosaur. Then, well on my way to knowing everything I was distracted. A new Fiesta guest arrived in the post and, it would have been plum daft to keep this one waiting too long. Move over a minute Bill would you and make room for Bob.